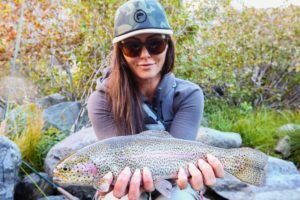 Chelsea Baum — better known on Instagram as Cherokeeflygirl — was flicking some practice casts when the fat rainbow hit her fly. Filson, the clothing outfitter, had corralled Baum for a photo shoot on the Yuba River. On a drift boat, the photographers were taking a break when the trout struck. It ran under the boat, Baum teased out the trout and it jumped, making a perfect, gorgeous arc out of the water — you know, the kind you see in fly fishing magazines — and it was gone. An experienced fly reeler, a boatload of photographers, and that wily rainbow outsmarted them all. That’s the battle that stands out the most to Baum. Not all the browns, rainbows, and cutthroats that made it into her net, but the beautiful one that flicked its head and got away without even a photo to show for it. It’s telling that this moment would be so memorable to Baum, who grew up lake fishing with her dad. Then, on a trip to Idaho she saw a man fly fishing. The beauty of the art, the beauty of the arcing rainbow: This is why Baum fly fishes. Although her dad was initially skeptical, Baum hired a guide to teach her and she hasn’t looked back. These days, she makes her living helping folks find homes and investment properties in Placer and Nevada Counties. But her heart lies on the nearby rivers of Northern California. “Maybe someday down the road, I’ll become a guide to teach beginners and take women out on the river.” But for now she’s happy to split her time. 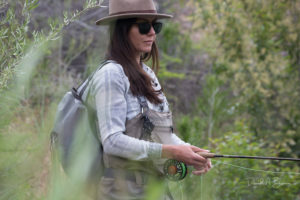 Although fly fishing is relatively popular in the area, not many women do it, and Baum would like to see this change. 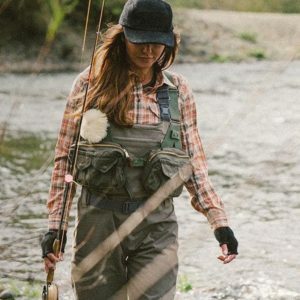 Especially since, from her home in Nevada City, there’s easy access to fly fishing on the Truckee, Feather, and Yuba Rivers. On full-day trips, she’ll hit the river — most often the Truckee — from sunrise to sunset. On workdays, she tries to get a couple hours of casting in when she can. Although rainbows and cutthroat are most common where she fishes, Baum loves the challenge that brown trout present. To catch them in her neck of the woods, she prefers a stripping technique with streamers. On high water days, however, she’s struck gold with browns using a nymphing presentation. Baum prefers a natural presentation, laying her fly at the edge of turbulence, and she changes it up frequently, depending on the latest hatch. But on her home waters, midges and San Juan worms are pretty reliable throughout the year. Reading the water is just as important as knowing what hatch is on. A favorite spot may produce different results if the water levels have changed. How does she know what to look for? “Look for the foam: Foam is home,” Baum says. And, as a realtor, she knows homes.